I have got a rather large indoor (I think it's indoor; how do you tell the difference?) 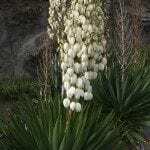 yucca. I am not sure how tall it will grow and the pot it is currently in is already quite large and hard to shift. I generally put it outside during summer and then bring it back in for winter. 1. How tall will it grow? 2. It has new leaves sprouting off the trunk lower down, do I/can I remove these for new plants? 3. How can I tell whether it is an out/indoor plant?